You don't get a second chance to make a first impression is a saying most of us have heard at some point. It should come as no surprise to you that when looking to create the best impression for your company, a potential client will make a quick judgement about you as an individual and also your company based on the quality of your customised workwear shirts. When looking to select a custom work shirt, it pays to choose a garment that is better quality for a lasting professional image. 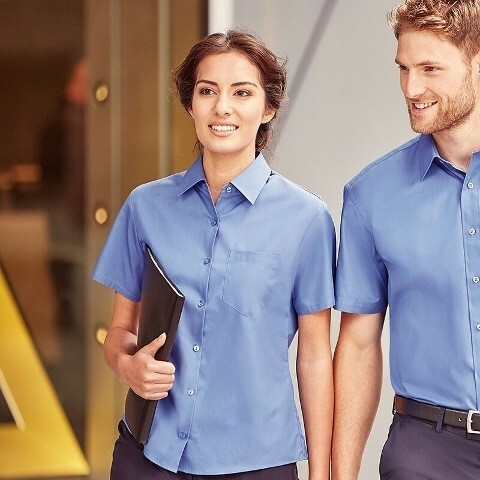 Customised clothing such as women's corporate Oxford blouse short-sleeved tailored fit styles and Long sleeve polycotton easycare poplin shirts for men are an ideal option when looking for a branded office wear solution. Whist for some product launches a t shirt or polo shirt will suffice, when looking to pitch to a more sophisticated market or client, a good quality personalised custom embroidered shirt or printed shirt can go a long way in opening new doors for your company. For staff and colleagues managing a conference or large scale event, having personnel dressed in official company branded work shirts helps to instill a sense of confidence and safety for individuals attending as guests. Having been on the receiving end of visiting sales representatives, the ones that have made the best impression by far are those who dress officially and have an executive appearance. Whilst a business polo shirt is a smart looking garment, nothing makes a statement about quality like an embroidered shirt. Practicality is key when choosing a custom work shirt for the travel industry. We can offer a large range of long sleeve and short sleeve shirts in coordinated styles with your travel company logo either embroidered or printed as per your requirements. Workwear and corporate clothing is worn and washed day after day and so we prefer to provide you with company clothing which you and your staff will feel happy wearing time and time again. We find that when compared to using inferior standard products inthe market place which may be cheaper, it pays in the long run to use well established industry tested brands for the best return on your budget. Let's Get Started With Your Custom Corporate Shirts Enquiry! To get started with your custom corporate shirt enquiry, just click the button below and describe in your own words what you would like help with and we will get back to you as quickly as possible.